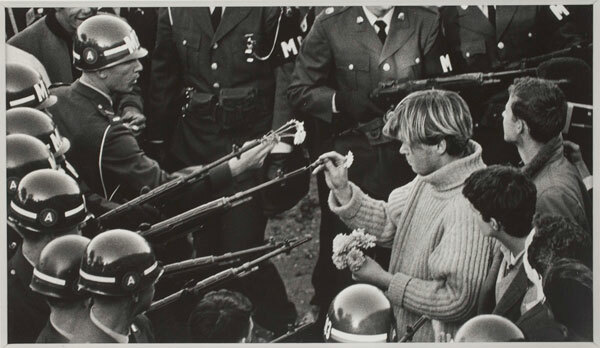 This memorable image of a young protester placing a flower in the barrel of a National Guardsman’s rife was captured during an anti-war march on the Pentagon. A staff photographer for the now-defunct Washington Star, he photographed the Civil Rights movement, and every American president from Harry Truman to Bill Clinton. Instict told him to climb a wall near the Pentagon entrance to observe this spontaneous confrontation. Boston’s editors ignored the poignant photograph, and when he exhibited the image it immediately became popular, becoming a finalist for the Pulitzer Prize.